The dressing? HOLY LOVE OF MY LIFE. To die for! I want to swim in a bowl of it. I could chug a glass for breakfast, it’s that good. Alright the last statement was extreme, but you get where I’m going with it. It’s simply delightful. 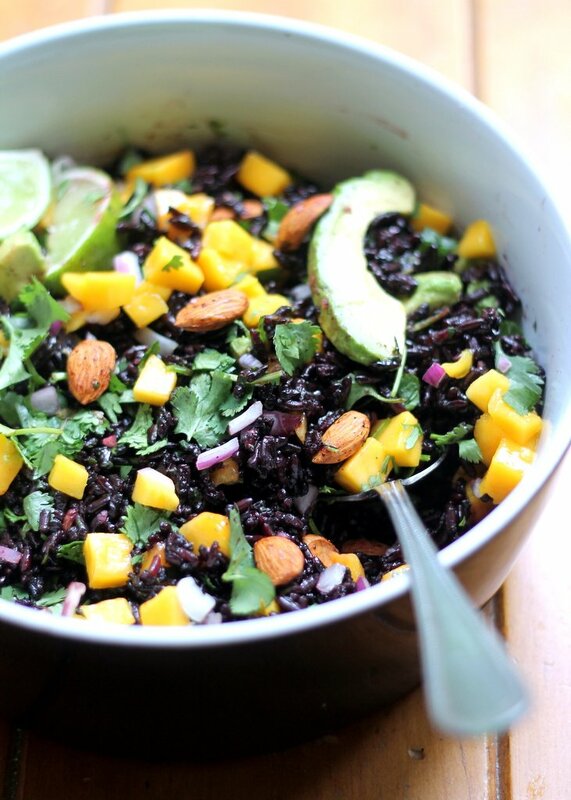 Now you might be wondering what black rice is and where you can find it. 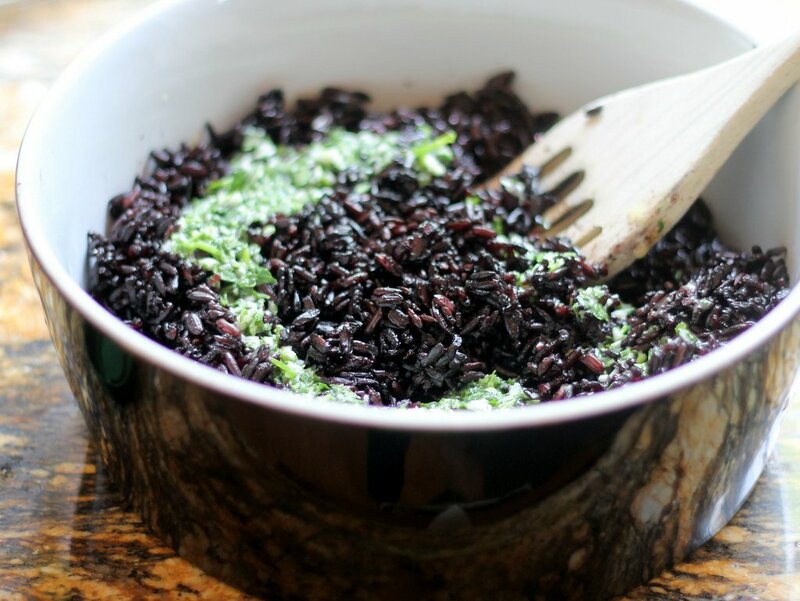 Also known as “Forbidden Rice”, black rice used to be grown in very small amounts and typically was only meant for emperors who ruled China long ago. The rice is a deep black color and turns a dark purple when cooked. It also is a chewy grain with incredible health benefits including vitamin E, antioxidants, and disease prevention chemicals (the good kind)! I highly encourage you to do some more research on this wonderful rice. Here’s a great article to get you started. I found organic black rice at Whole Foods, and that’s probably going to be your best bet. Otherwise you could always order it online. If you can’t find black rice, quinoa or jasmine brown rice would be a nice substitute. This rice salad really has it all. 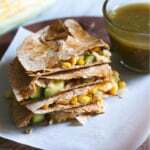 Sweet mango, creamy avocado, the nutty crunch from the almonds, and the fresh taste from the dressing and cilantro. It’s perfect for potlucks, served by itself, or would be great with grilled chicken or fish. 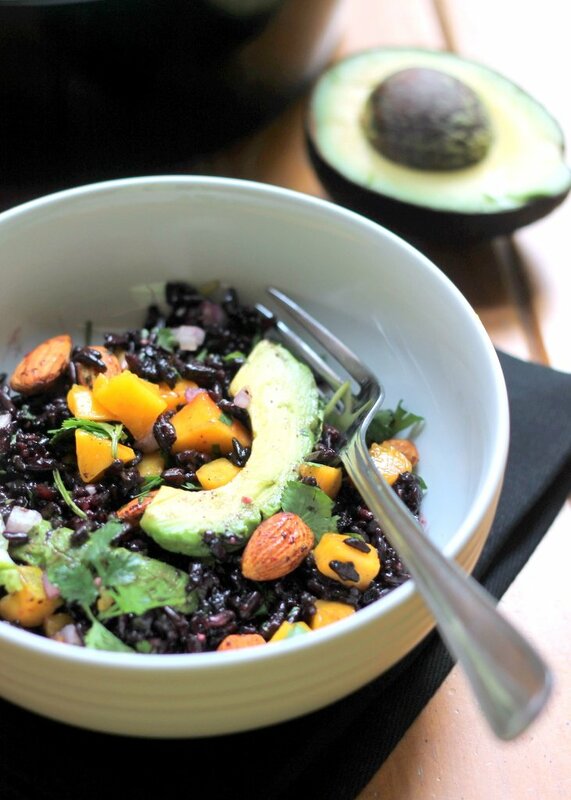 A fresh and flavorful, nutrient packed black rice salad with mango and avocado. Served with the most incredible cilantro-lime vinaigrette. Vegan and gluten free! While rice is cooking prepare the dressing: Combine lime juice, olive oil, garlic, honey (or agave), cilantro, and salt in a food processor. Process for 15-30 seconds or until dressing is combined. Once rice is done cooking and has cooled a bit, stir in dressing and . 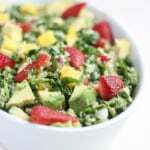 Cover bowl and place in fridge for an hour or until cool and you are ready to add in the rest of the salad ingredients. Life Lately + a BlogHer Food recap Happy Weekend: 15 things I’m loving. 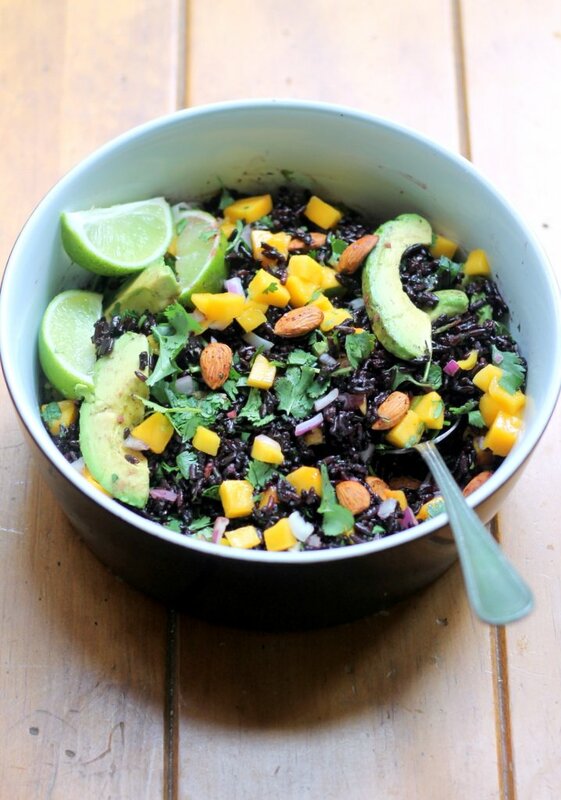 54 Responses to "Mango & Avocado Black Rice Salad with Cilantro-Lime Vinaigrette"
This looks great! Off topic a bit, but can you tell me what kind/brand of olive oil you use? I’ve been trying to find a great tasting, yet not overly-expensive EVOO! Thanks! The extra light olive oil is the 3rd press. Not the best oil to get! Looks amazing! 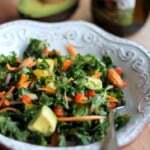 Not surprised to see another amazing salad from you! Oh yeah, I know what’s for dinner tonight 😉 Great post! Happy to see you pursuing your dreams! Just made this. WONDERFUL! Will keep it in the regular rotation. Thanks! I like your "Tuesday Preach"! And I really like this salad! I made this for dinner last night. My husband and teenage son were skeptical – but could not get enough of it once they tried it. My husband woke up this morning and said he had thought about it all night and was so glad that there were leftovers for his lunch! Thanks for such a great recipe. I made this last night and substituted quinoa because I didn’t want to go to the store! I loved it that way and I’m sure the black rice would be great too. Definitely keeping this in the rotation. And P.S…..good for you for pursuing your dreams. It’s probably one of the scariest, yet rewarding choices you can make. 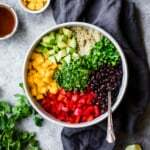 I just had this salad for lunch, and both my boyfriend and I found it very delicious! 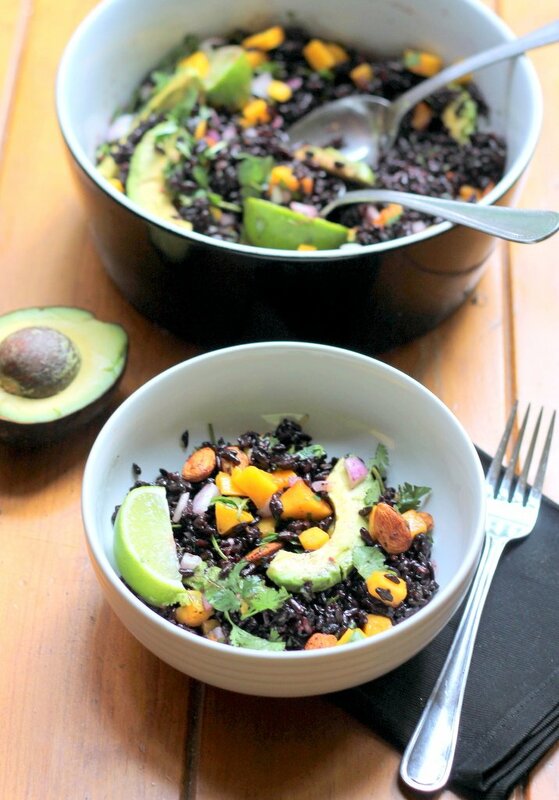 I substituted the black rice for quinoa and added black beans for color and extra nutritional value and we loved it! Thank you! I'm excited about the combination of rice & mango. I'm making this tomorrow! Will be taking my black rice/ chick pea/ glazed tempeh to a potluck tomorrow. I am adding some diced red pepper, diced carrot and some diced dried apricot since there are no mangos in season right now. I love rice and grain salads to take to potlucks. The glazed tempeh recipe can be found on The Tempeh Girls Facebook page. 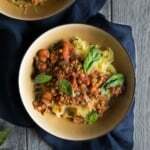 Looks fab – I think I’ve just found dinner for tonight! I really liked the idea of this dish, but what I made was absolutely disgusting. I may have made a few too many mistakes… First off, I used wild rice instead of black rice. Then, I used lemon instead of lime, parsley leaves instead of cilantro, and pistachios instead of almonds. I though that each substitution was valid, but boy was I wrong. From the nutty and weirdly cardboard-like taste of the rice to the sour dressing, I found my interpretation of this recipe vomit worthy. Beware. I’m confused. You changed the entire recipe. Yes. And I recommend not doing that. Made this yesterday for a potluck gathering. It was the talk of the table. Absolutely amazing! Thank you. 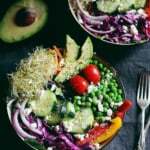 I’m a new vegan, and I don’t usually follow recipes. I know that I’ll have fun making your recipe, and I’ll get a lot of health benefits from it. I’m Haitian, so black rice was a staple growing up. I think my family will enjoy this new dish too. I also made it with quinoa and replaced mango with pineapple, that combination was also a winner! I LOVE this recipe! One warning… Only use fresh cilantro :). I love cilantro, and used fresh the first time I made this. 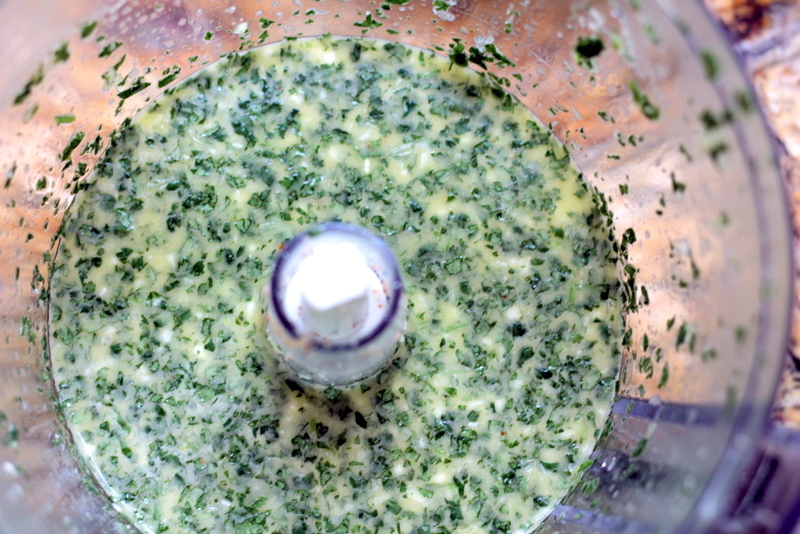 The second time, I was in a hurry and used dried cilantro. It kind of ruined the batch. 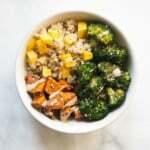 Also, in one batch, instead of mango I went to whole foods salad bar and got grilled pineapple, red onions, carrots, and celery; then chopped all that up really fine, then I add that mixture to the rice when serving. Really freaking delicious! DELICIOUS. Made this last night with the addition of both queso fresco and seco crumbles (I love cheese). My guests multiple times remarked that it was fabulous. The almonds are a nice touch. I made some of the dressing without cilantro for a “cilantro tastes like soap” friend, and she also said it was an awesome meal. Amazing! So happy to hear that, Portia 🙂 Also the cheese additions sound delicious! This salad is amazing! I added more mangos, pineapple, and blackberries. It is refreshing, beyond delicious. I think I could eat this every single day! Love the chewy nuttiness of the black rice too. Deserves more than 5 stars! YUM the extra fruit sounds delicious in here! Glad you love this one! I swear, I am not recipe stalking! Once I found your site and tried the Butternut Squash Enchies, I was hooked. (I dream of the cashew crema…….lol). Hey recipe stalking is the best way to cook! 😉 Love that cashew crema. And absolutely, try this one next!